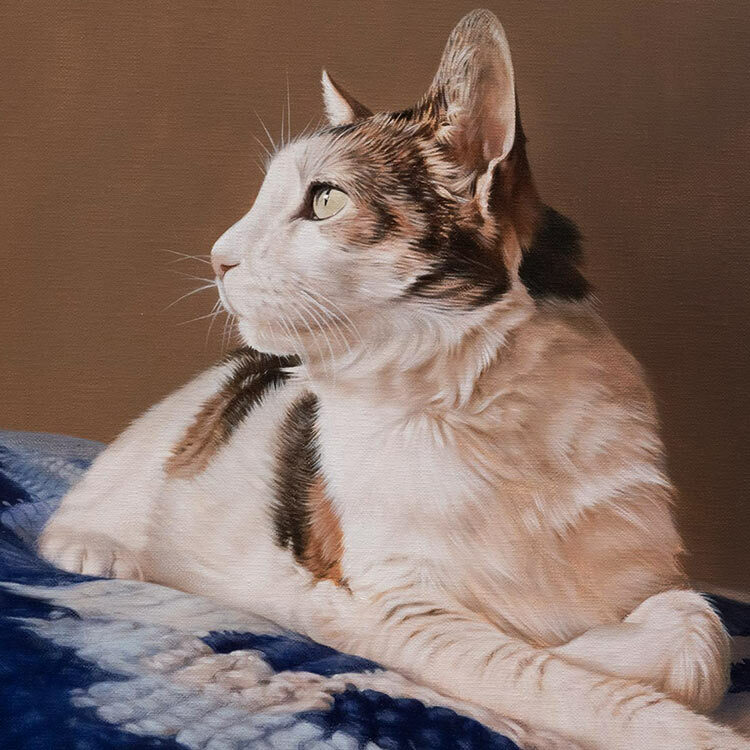 Welcome to our gallery for pet portraits in oils. Nicholas specialises in the oil paintings and I, Melanie, specialise in the pencil drawings. This gallery is a collection of his oil painting commissions. The oil paintings below depict just a handful of the oil portraits that Nicholas has created for clients recently. Our gallery is always being updated with his latest work. Our oil paintings are painted on professionally stretched fine grain Italian Linen canvas. 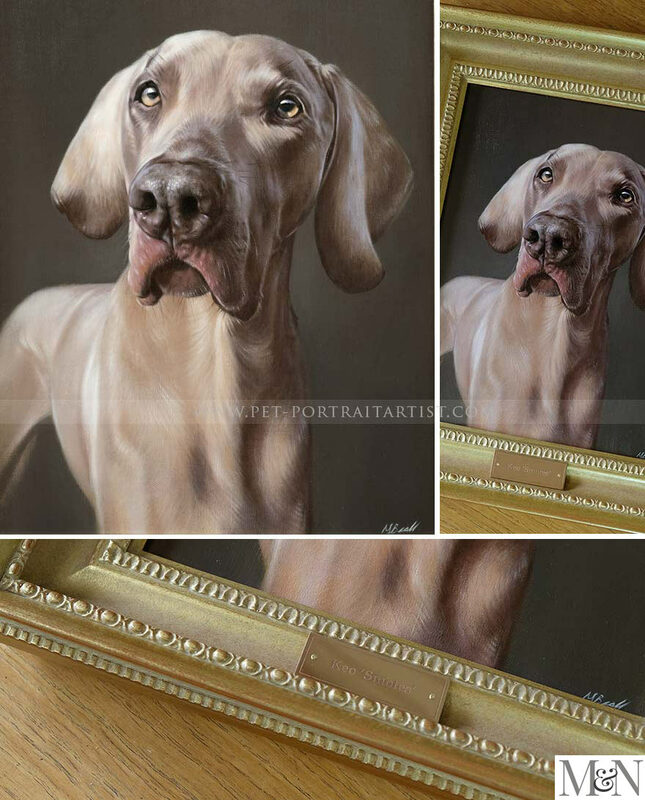 You can read about our canvases and materials on our Pet Portraits Materials page. Nicholas stands at his easel and paints portraits full time for a living. He absolutely loves every day in the studio. 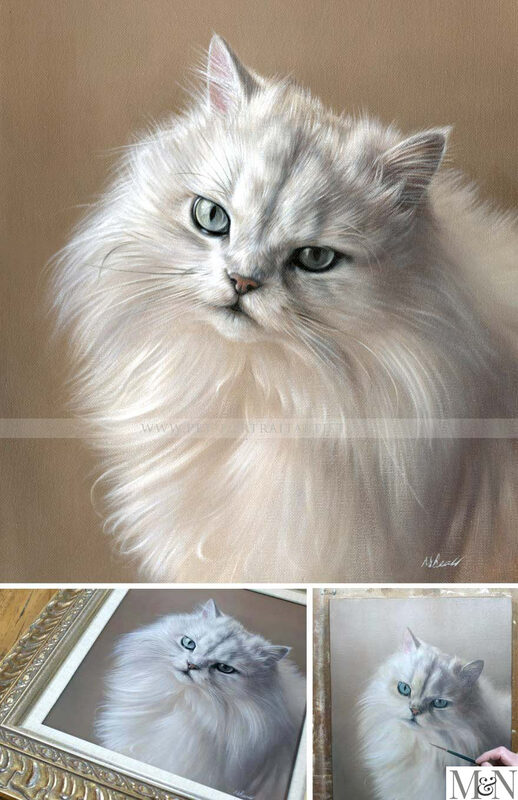 I'm sure you can see his love of animals coming through in his oil paintings. Nicholas' work is in demand and he has a commissions list. He is always booked up in advance. If you are looking to have an oil portrait painted for a special occasion, please let us know as soon as possible. Pop over to our contact page where you can email us at any time. 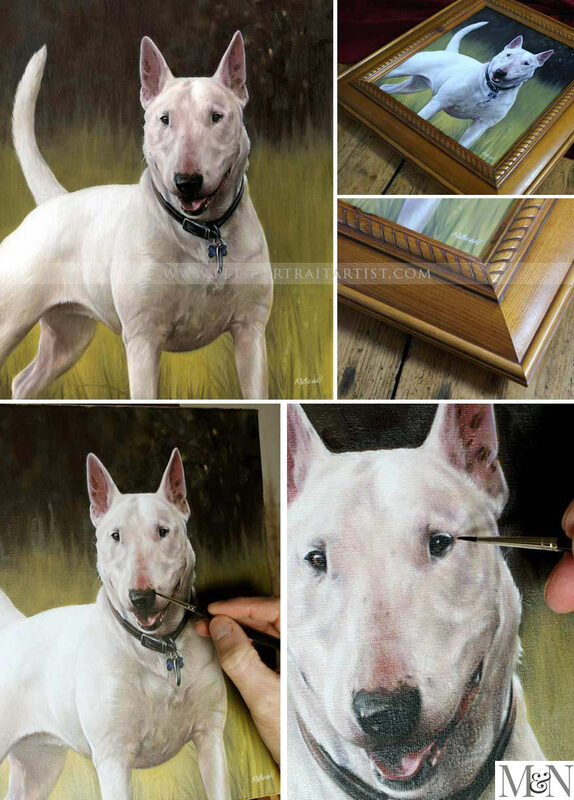 Charlie Cleaver emailed to find out if it would be possible to complete an oil painting of their dog Hattie for her partner, Simon's birthday. Simon was a budding photographer and so had already taken many photos of Hattie over the years. Charlie sent us a few of her favourite photos and one particular photo stood out to us. The background and overall colours were natural greens and ochres and it worked beautifully for a portrait as you can see below from the final stage. Charlie lived in a very modern home and so wanted to display the painting unframed so Nicholas painted the edges of the canvas for her, which you can see in the photos below. The oil painting of Charlie and Eliot was commissioned by Nicole in the USA. The portrait was painted by Nicholas at 20" x 16" size on fine grain Italian Linen canvas. Nicole was absolutely thrilled with the portrait and if you click on the photo below you can read much more about the commission. Read a full testimonial from Nicole, plus see Charlie and Eliot with their painting too. I received the painting today. It is so beautiful. Truly perfect, exactly what I was hoping for. I can't wait to frame and hang it. The oil painting of Keo was hand painted by Nicholas in oils on linen canvas and framed using our Regent frame. We also had an engraved plaque made and the whole ensemble works so well together. Lindsey commissioned the oil painting as a surprise for her husband and a joint gift for both of them to enjoy. 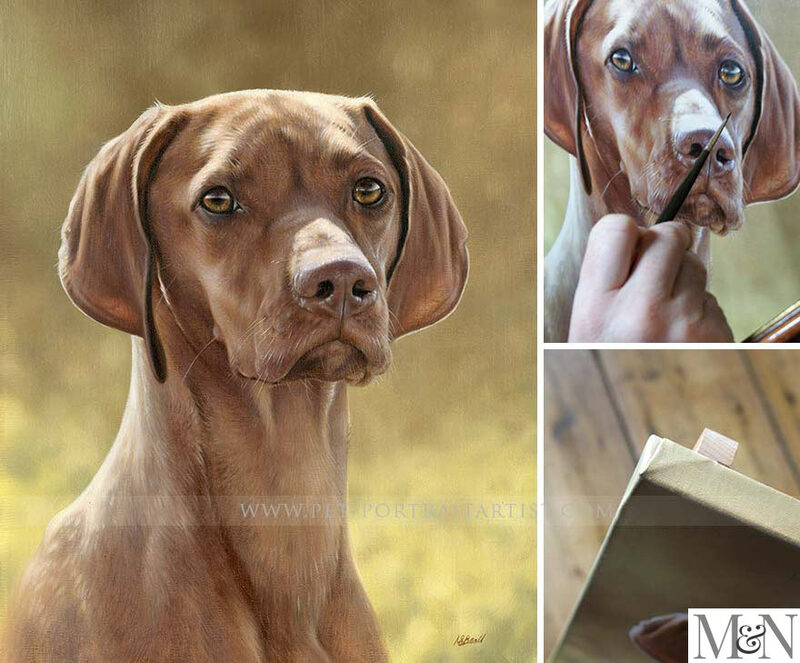 Nicholas really loves painting Weimaraners - if you have a Weimaraner similar to Keo please do get in touch, he would love to work with you! Hi Melanie and Nicholas, This is great news!! It is absolutely perfect, thank you so much. They will love it! Cindy and her family sadly lost boone in 2018 and so commissioned an oil painting as a memorial to remember him by. 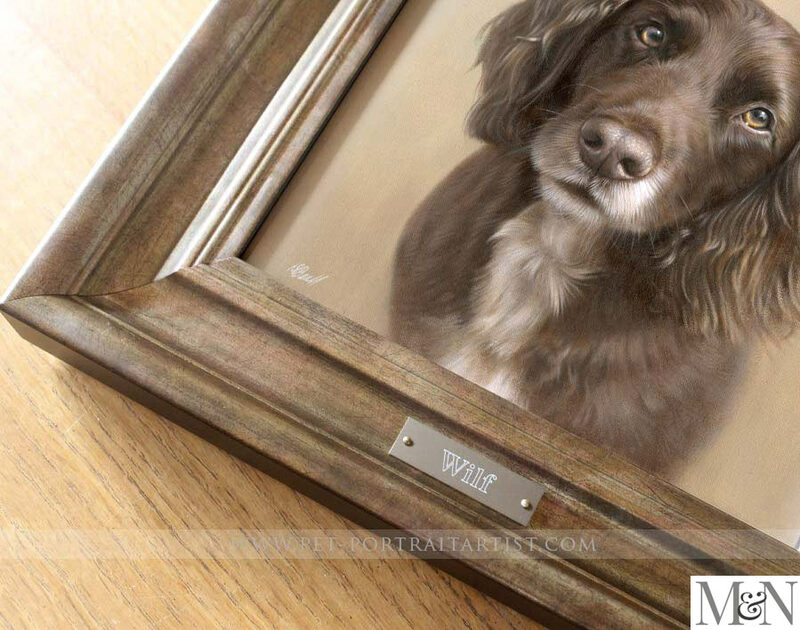 You can see Boones full portrait and read all about him on our dog portraits gallery on our dog portraits website. The portrait was framed in our Hampstead Frame with an engraved plaque to complete the portrait. The photos are stunning! I can only imagine how beautiful the portrait will be in person! I will definitely let you know when it arrives. 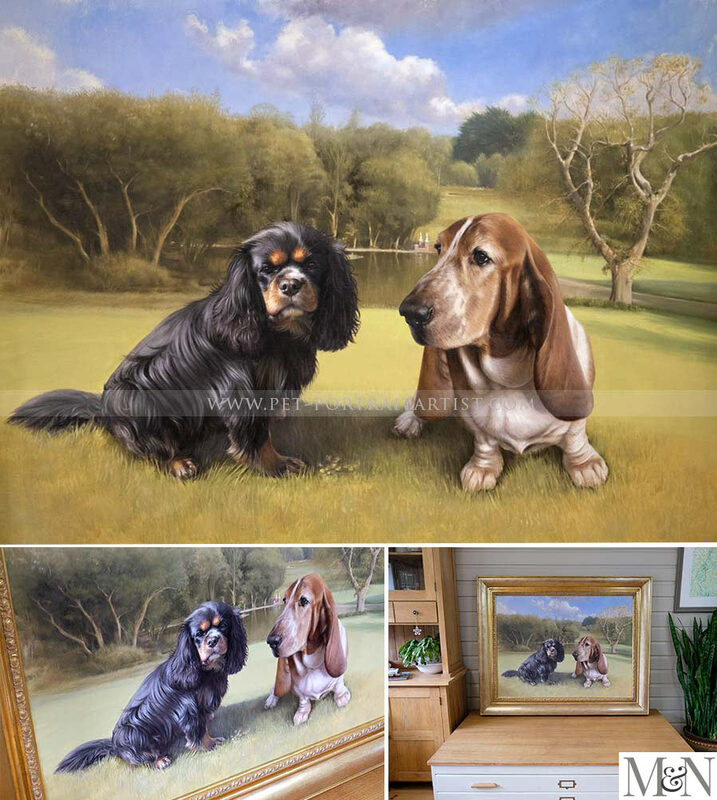 Judith and her husband were given a gift voucher from their daughter so that they could have an oil painting of their two dogs Harry and Oscar. The oil painting was created at 20 x 16 size and Judy and her husband were delighted. 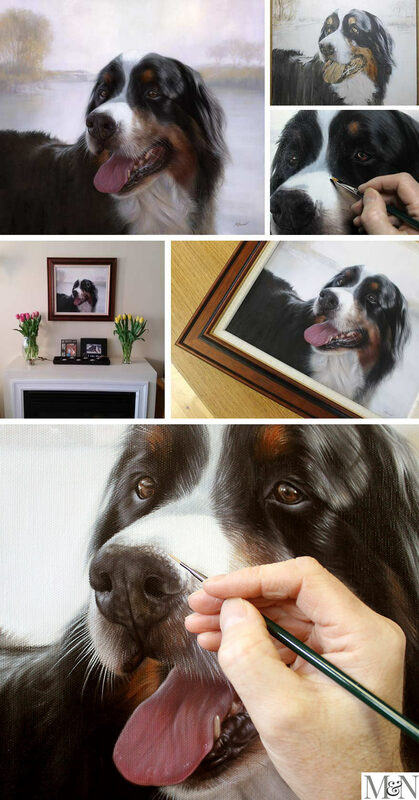 You can see a photo of the dog and the painting below. It’s just beautiful and captures our “boyz” looking very natural in their best poses!! Thank you, Thank you! Luke the Corgi is a dog who resides locally and goes to Dog Obedience training with our dog Lily. Suzanna commissioned an oil painting with full background of Luke as she loved Nicholas' work so much. We were able to take photos of Luke and Nicholas could study him too. This isn’t necessary however, if you can see the dog in real life - then why not! Luke came to our art studio personally to collect his painting and as you can see from the photo below he was thrilled! As was Suzanna too! John Smith commissioned a 30" x 20" oil painting as a surprise birthday present in 2018. The portrait was framed in our stunning Hampton frame along with a lovely engraved plaque. My wife saw the painting on her birthday and loved it, as well as shedding a tear or two. Nicholas has captured them perfectly, Dessie always happy and Jasper with that glass half empty look. Steve (UK) enquired about having an oil painting created of his dearly loved and very much missed Springer Spaniel Wilf. 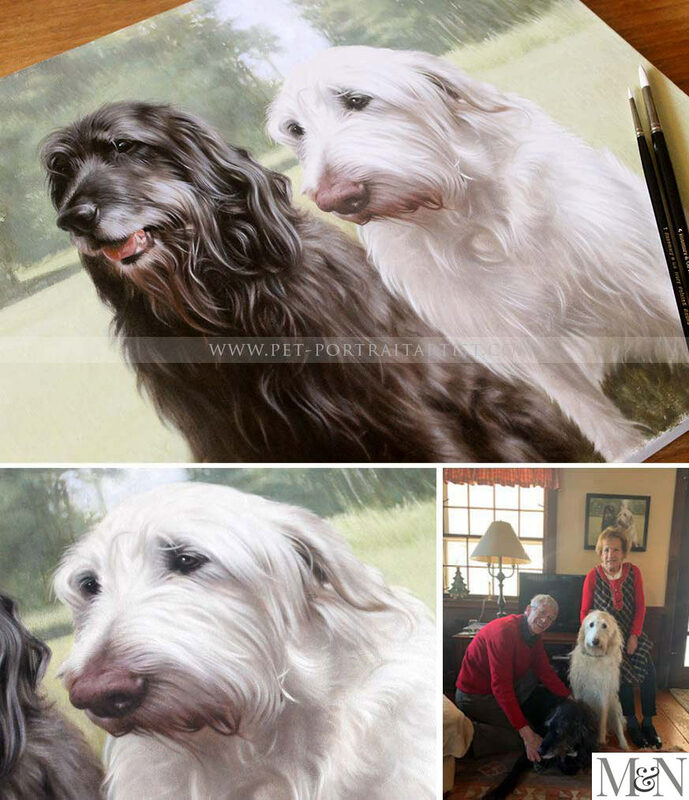 He wanted to commission an oil painting for his wife Maureen, as a surprise. Steve emailed us the perfect photo of Wilf for a portrait and requested a 12 x 10 size painting. Due to Wilf's beautiful ears and the composition of the portrait we decided an 11 x 11 portrait would suit the shape of the photo well. Steve also asked if we would frame the portrait and also add an engraved plaque to complete everything. We chose the bronze colour plaque to match our Langham frame and it all works beautifully. If you head on over to the Langham Framing page you can also see a video of Wilf's painting too. Thank you so so much for this beautiful painting of my boy Wilf. Your husband has caught him to perfection - brought tears to my eyes to be reminded of what a handsome dog he was. Thank you! Jennifer, USA, emailed our studio to find out if we would be able to paint a surprise oil painting for her husbands birthday in 2018. 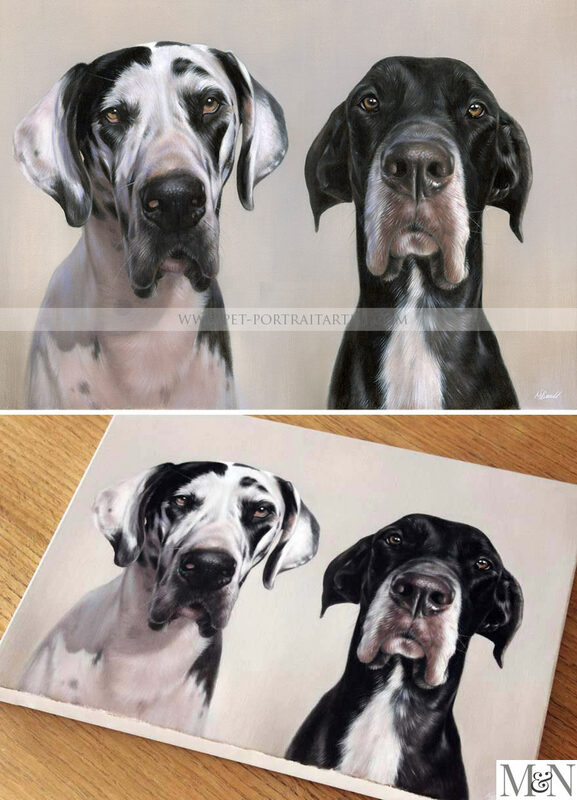 We were delighted and Nicholas was thrilled to have the opportunity to paint two beautiful Great Danes. Jennifer requested a 16 x 12 oil painting and opted for a light grey and cream to work with her home decor colour scheme. It’s absolutely perfect. I am more than thrilled and I know my husband is going to love it. The oil painting of Amba and Maddie was created by Nicholas at 21 x 21 inches. Neil did a number of photo-shoots with his dogs Amba and Maddie in his garden and also supplied us with photos of them out in the field where they walk for background reference. 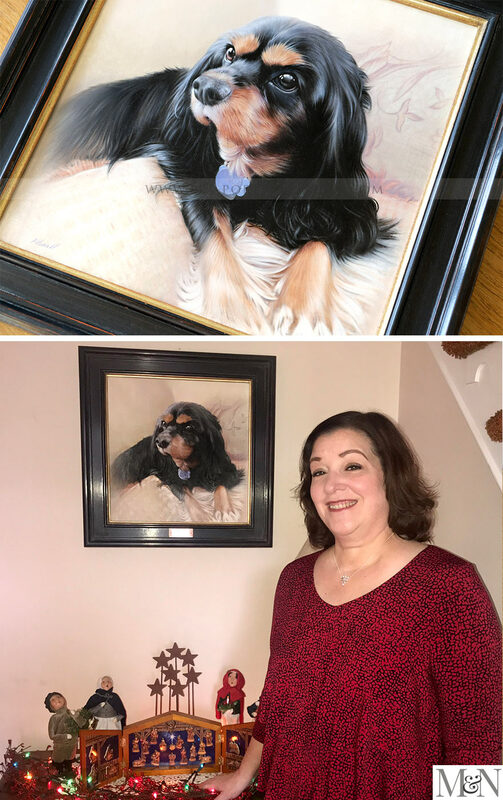 The oil painting was commissioned as a birthday surprise for his wife Jackie and you can see a photo of Jackie below with the completed portrait and both dogs too! Neil requested our framer to frame the portrait and we used the Highgate frame which fitted perfectly. It looks fantastic, I couldn’t be happier with it and given that Amba and Maddie are really Jackie’s loves I just can’t wait to see her reaction, I will let you know. The hard bit of course was packing it all back up again ready for presentation on Sunday but with the help of Lyndsey I think we’ve done it. Thank you once again, and please send my thanks to Nicholas. Shane emailed from Ontario Canada to find out if we could paint Yogi, their Burnese Mountain Dog as a surprise for his wife. Shane said.."Yogi is very much a big cuddly bear – he is Mama’s boy and she will be thrilled!" Shane commissioned an oil painting 16 x 16 inches along with our Traditional Flat frame with inner linen slip. 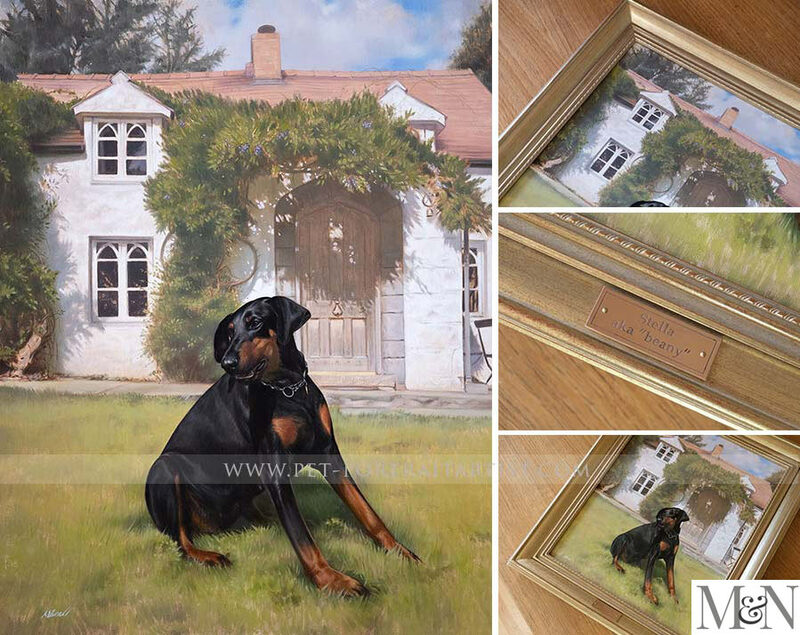 We have added photos of the dog pet portrait painting in progress, the final stage and a photo that Shane and his family took when the painting was displayed on their wall. Read an amazing testimonials from Nikki below. Yogi arrived two weeks ago and I have been trying to come up with the words to say Thank you but I don’t feel Thank you is enough.I have tears in my eyes, and I cannot believe how absolutely stunning his painting is. You have captured his beauty magnificently. You have not only produced a work of art but you have touched my heart in a way that words just can’t describe.Yogi is very special to me and we have had our ups and downs many times. I know there will be a day when he will no longer be with us and to have that painting of him on the wall, will bring much comfort to us. Shane has really out done himself with this gift, this will keep him out of the “dog house” for years to come lol. I just want to say Thank you so much from the bottom of my heart for the beautiful painting. You two are extremely talented and it has not gone unrecognized, I have told many people about how amazing you are. Please take good care and If ever we find ourselves out your way we will be stopping in on you I hope you don’t mind. Kristian contacted us to ask if we would be able to create a memorial painting of Boomer. He requested a 24 x 18 oil painting along with a frame. Kristian had a number of lovely photos of Boomer, one they particularly liked was of Boomer sitting in a shaft of sunlight. Nicholas was thrilled to paint from this photo as he loves painting 'light' in his oil paintings. The portrait was framed using our Traditional Flat frame and wheat coloured inner linen slip, which really brings out the white areas on Boomer well. Kristian presented the painting to his girlfriend and they very kindly posed for a photo with the painting which you can see below, along with an email from Kristian too. 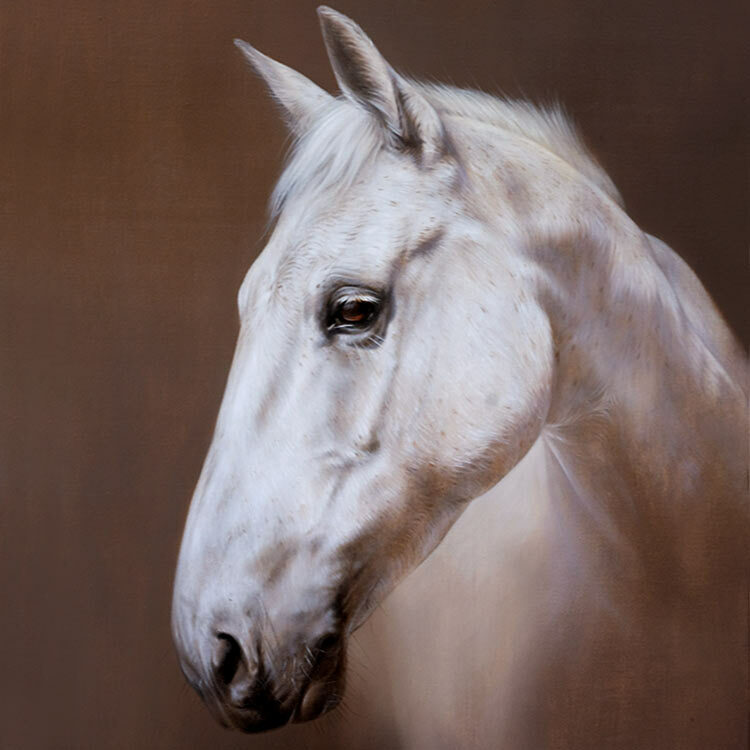 Returning customer Gill, emailed to find out if we would be able to create an oil painting of Artu, their daughters horse for her birthday. Bella was to be surprised with a painting of Artu and Gill had endeavoured to take photos of Artu when Bella wasn’t home. Nicholas created the portrait at 12 x 10 size on Italian linen Canvas. Nicholas worked hard to complete the painting and it arrived with Gill the day before Bella's birthday - just in time! We do like to meet deadlines if we can! I have added a couple of Gill's emails below along with a final stage of Artu, the photo they took at their stables along with photos of Nicholas painting. 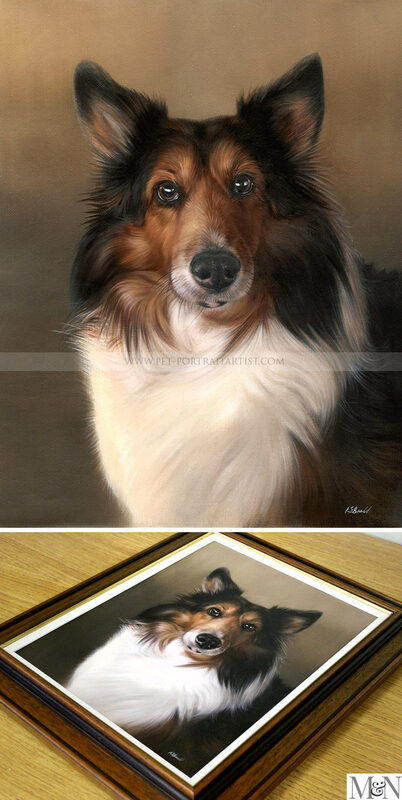 Kevin commissioned Nicholas to create an oil painting of their two dogs Maggie and Max for his wife’s 50th birthday. Kevin wanted the portrait to be a 16 x 12 oil painting with our framer framing the painting using our Traditional Flat frame with inner linen slip. Kevin and his family were so kind to pose with the painting when it was presented to his wife, you can see the photo below, along with some of the photos of Nicholas painting and the framed finished painting too. Nicholas painted Lucy’s Chinchilla cat for her mums 60th birthday. The oil painting on linen canvas of Sampson was traditionally hand painted by Nicholas on a 12 x 10 size and framed by our local framer using the Ornate Pewter frame. Its such a lovely frame and works really well with Sampson’s white coat. Lucy and her mum were thrilled with the results and you can read one of Lucy's emails below along with seeing photos of the final stage, the portrait framed and Nicholas working on the painting during a mid stage. 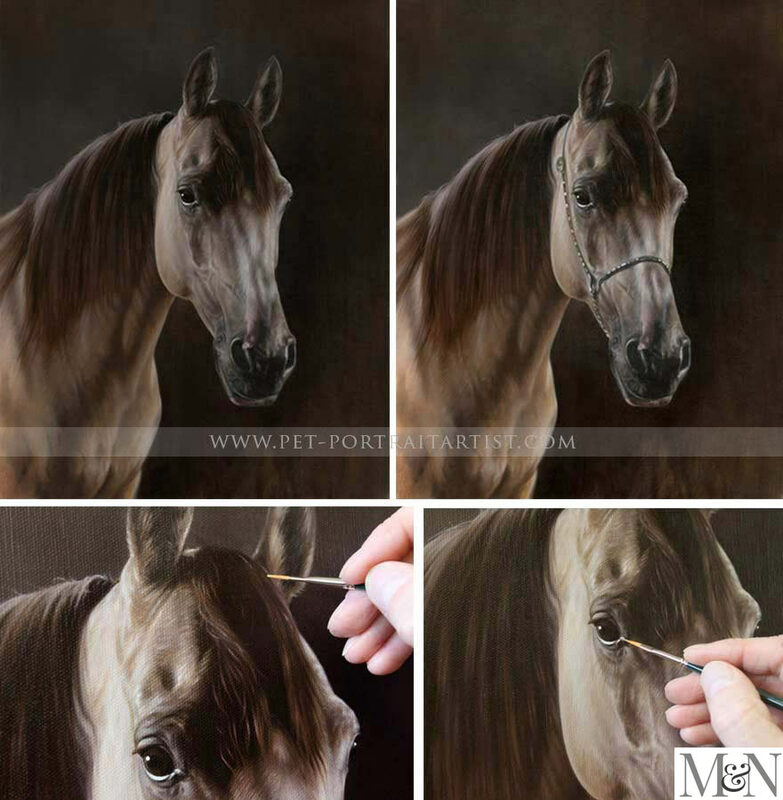 Marianne, a returning customer form Canada, commissioned another painting of her beautiful new horse called Remy. She had taken some stunning photos with really dark background in her large riding stables and the entire set of photos were perfect to paint from. After much discussion Marianne settled on one of her favourite photos and Nicholas set about painting it. Marianne was thrilled with the end result but then upon completion put in a request! She had photos of Remy in a similar pose taken with a special decorative halter and she wondered if Nicholas could paint this on the completed portrait. As the photo of Remy with his halter was at a very similar angle, this definitely could be achieved. We like both final stages, with and without the halter. Which is your preference?! A beautiful double portrait of two Shih Tzu's called Dora and Dolly commissioned for Lady Bamford's private collection. Pattie and Tom Herman emailed us from Hawaii, asking if we would be able to create a memorial painting of their loved and very much missed dog called Shamrock's Remington Herman - or Remi for short. Remington was a English Bulldog with a full head and beautiful red brindle colouring. Pattie said..."Remington was a Grand Champion, really knew how to "show off" in the show ring. But a really goofy couch potato at home." Tom and Pattie wanted Nicholas to portray Remi in a 16 x 16 oil painting on canvas. During the time of chatting to Tom and Pattie, so much happened. We lost our wonderful dog Tom around the same time as they lost Remi. They were very lucky to get a new puppy called Baxter which you can see below in the photos and we were lucky to have a new puppy called Lily. Working so closely with clients we certainly have made many friends all over the world and Tom and Pattie are close to our hearts. Aloha Melanie and Nicholas! Tom here - wanted to let you know that we received the painting today. It was great to bring Remi home. Thank you very much for this. We’ll send you pictures when it has been framed and placed. Lana contacted us to purchase a gift voucher for her husband Ashley as a surprise gift for Christmas. Lana wanted to allow Ashley to choose exactly what he wanted - from the photos, composition and his own choice of frame too. Gift vouchers are the perfect option for letting the recipient have full control. Ashley contacted us soon after he received the voucher as he was excited about having a painting of his best buddy Millie, an English Bulldog. Ashley opted for a 12 x 10 three quarter pose painting with a background in oils. He also chose our 'rope frame' which is sadly now discontinued, it was one of our favourite frames too. Ashley was really lucky to have one of the last remaining mouldings! Ashley called us here in the studio to thank us personally for his painting, the email below was when Ashley saw the final stage.